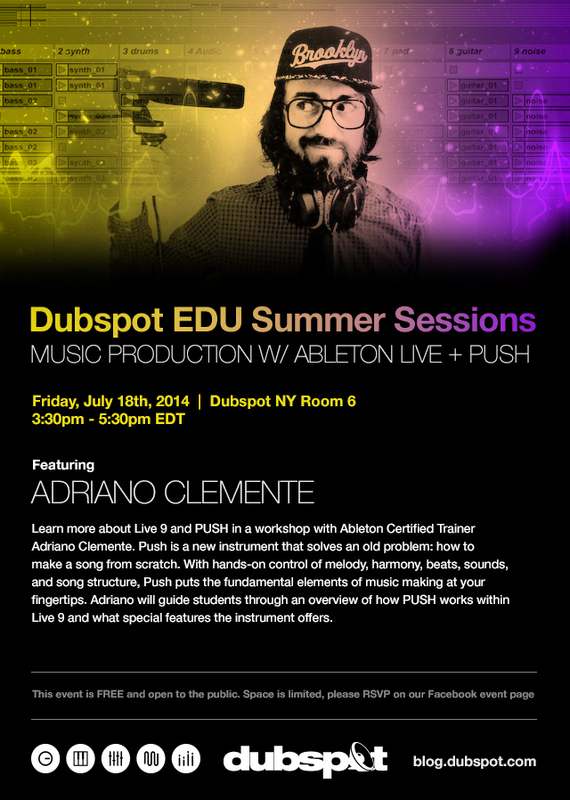 On Friday July 18th, we kick off our series of FREE workshops at our NYC campus with a presentation of the Ableton Push with Dubspot Labs director, Adriano Clemente. Interested in taking Music Production w/ Ableton Live classes Dubspot? We have classes starting 7/21 and 8/4 in NYC and 9/22 in LA. This course is also available online. Register today! Push is a new instrument that solves an old problem: how to make a song from scratch. With hands-on control of melody and harmony, beats, sounds, and song structure, Push puts the fundamental elements of music making at your fingertips. Adriano will guide students through an overview of how PUSH works within Live 9 and what special features the instrument offers. This FREE event is open to the public and space is limited. Adriano displays the improvisational capabilities of Ableton Push at Dubspot. Classes Starting Soon, Register today!